The Galaxy Book doesn't do anything badly, but it also doesn't really stand out. It took a few years, but Microsoft's Surface Pro line is an undeniable hit. It also popularized the convertible tablet category: touchscreen-driven devices you can hold in your hands that also have power and attachable keyboards for getting "real work" done. The Surface Pro's success means it has its fair share of imitators, from Apple, Google and the swath of Windows PC makers out there. 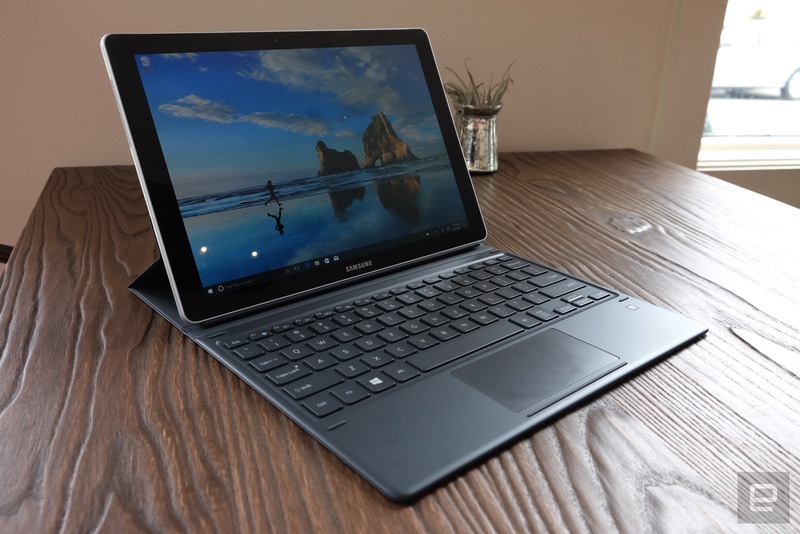 Naturally, Samsung produced its own, last year's Galaxy TabPro S. That device features a great screen and solid battery life but was hurt by a terrible keyboard and slow performance. With the new Galaxy Book, Samsung appears to have fixed those issues -- this convertible has a more spacious keyboard and Intel's seventh-generation Core i5 processor on board. But all that power introduces some unfortunate trade-offs. The Galaxy Book features a lovely screen, solidly-built hardware, and more than enough power for most mobile users. But mediocre battery life, a flimsy keyboard cover and a relatively high price make it hard to recommend. 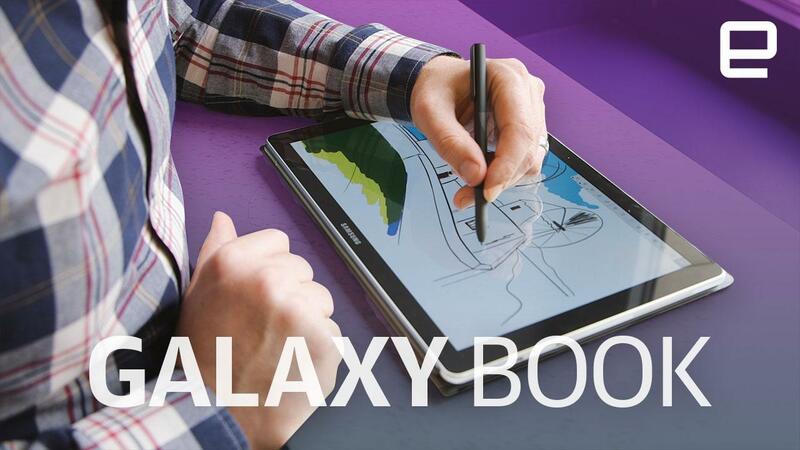 Be the first to review the Galaxy Book 12-inch? Probably the most important part of a tablet is its screen, and the Galaxy Book is no letdown here. The 12-inch display is of the Super AMOLED+ variety, with rich colors and inky dark blacks. The screen is running at a 2,160 x 1,440 resolution though it's also set to scale text and UI elements up to 150 percent so everything isn't completely illegible. Regardless, the workspace feels sufficiently spacious for a 12-inch screen and text is razor-sharp. I can only think of one problem with the display: Its wide 16:10.7 aspect ratio makes holding the Galaxy Book in portrait an awkward experience. Since this tablet was designed to be docked into a keyboard, it's not surprising that its size was optimized for landscape use, but I generally prefer the proportions of Apple's iPad Pro (4:3) and Microsoft's Surface Pro (3:2); those devices feel equally suited to portrait and landscape usage. Even if it did have different proportions, the Galaxy Book isn't really made to be held for long periods of time. It weighs in 1.66 pounds -- light for a computer with a Core i5 processor but quite heavy for a tablet. That's the problem with most larger convertibles in general. Sure, you can use them as standalone tablets, but you probably won't want to. Overall, the Galaxy Book is a relatively plain, spartan device. Two speaker grilles can be found on the left and right edges; they produce surprisingly decent audio. There's a fan vent up top, along with a power switch and volume rocker. The right side also houses two USB-C connections and a headphone jack, the only ports to be found here. The back of the Galaxy Tab is pretty plain, with a Samsung logo, small camera bump and a few ridiculous Intel stickers. If you opt for the model featuring built-in Verizon LTE, your device will also be graced with a giant Verizon logo on the back. Oh goody. The back camera comes in at 13-megapixels and is paired with a 5-megapixel front-facing shooter. They're both... fine. The front-facing camera is arguably much more important on a device like this, and it worked well in video chat, which is all most will rely on it for. 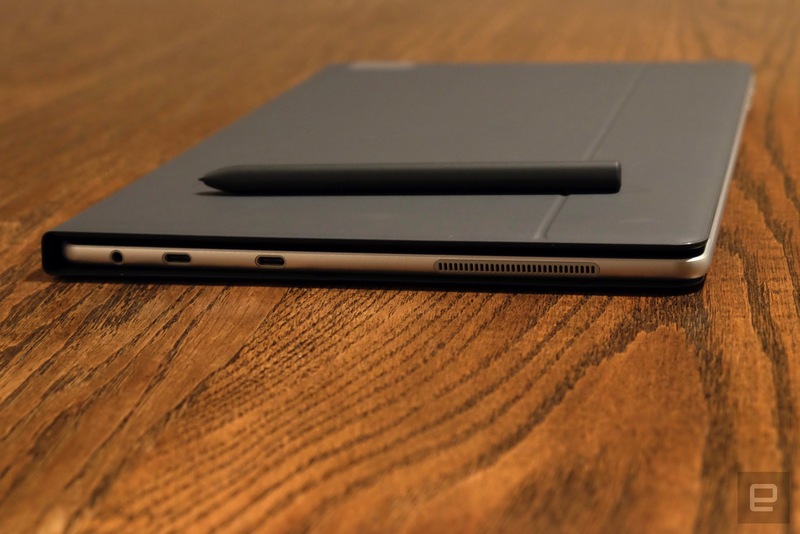 The Galaxy Book hardware gets the job done, but lacks the refinement and class of the iPad Pro or the Surface Pro's unique design and adjustable hinge. It doesn't do anything wrong, but it also doesn't push the tablet form factor forward in any notable way. Samsung makes it clear that the Galaxy Book is meant for getting things done by including a keyboard cover, just as it did last year with the TabPro S. It's a smart move -- looking at the marketing for the Surface Pro, you'd be forgiven for assuming the keyboard comes with it -- it doesn't. 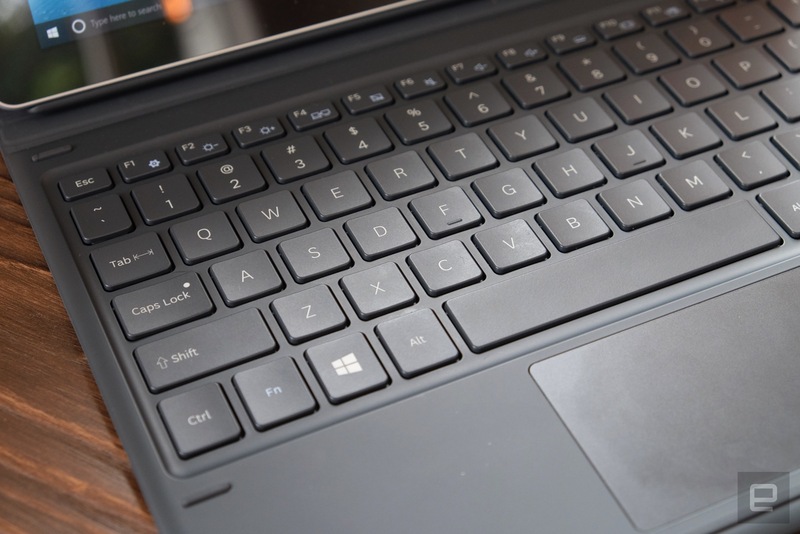 The other bit of good news is that the Galaxy Book's keyboard is a big improvement over the one that came with the TabPro S.
It's basically a full-size keyboard with the same layout found on most Windows 10 laptops. The keys in the function row are small, but the others are full size. So, there's basically no adjustment period or learning curve, which can't be said for the iPad Pro's Smart Keyboard. Still, it's not an especially good keyboard. The key travel is naturally shallow to make it work in such a thin device. That said, it's comfortable enough that I generally didn't think about it. Samsung even made it backlit -- something I did not expect. Unfortunately, the experience falls apart when you're not typing on a desk, table or some other flat surface. Most convertibles still have compromised experiences when you use them in your lap, and the Galaxy Book is no exception. The keyboard cover is thin and light, which is good for not adding a lot of bulk -- but it's also extremely bendy and flimsy feeling. When resting my palms on either side of the trackpad and typing away, I could bend the keyboard so much that I'd accidentally "click" the trackpad, which is very distracting. It's even easier to do this if you rest a single hand on a palm rest; the unbalanced weight clicks the trackpad immediately. Once I figured out what was happening, I could go out of my way to avoid it, but this just goes to show how tough it is to get the typing experience right on a device with this form factor. The Galaxy Book's keyboard cover also functions as a stand. It can be propped up at three different angles and also can be laid down at a slight angle with the keyboard hidden (for drawing with the S Pen). These angles work pretty well, but the flexibility of the Surface Pro's hinge is hard to ignore. Microsoft's convertible hasn't always worked great in the lap, but the company has made big improvements over the years. Samsung still has a lot of work to do here. That's primarily because the combination of the full-size keyboard plus the "wedge" holding the screen up makes the Galaxy Book pretty big in the lap. Fortunately, the magnetic connection between the stand and the tablet itself is pretty strong. While the Galaxy Book runs a mostly unmodified version of Windows 10, Samsung did include a few extra apps here to help users take advantage of its S Pen, which comes in the box alongside the keyboard. Again, I have to give Samsung props for including this accessory for free, something neither Microsoft nor Apple are doing. One of the extra apps is Samsung Notes, which functions as a digital canvas that can sync between your Galaxy Book and a Samsung smartphone. Oddly, Samsung notes isn't a complete note-taking solution. Although you can jot down text, draw images and attach photos to your notes, the only place you can do keyboard text entry is the "title" field. That means if you also want to take text notes (as most of us do), you'll need to use another app. That's enough to make Samsung Notes useless for me. 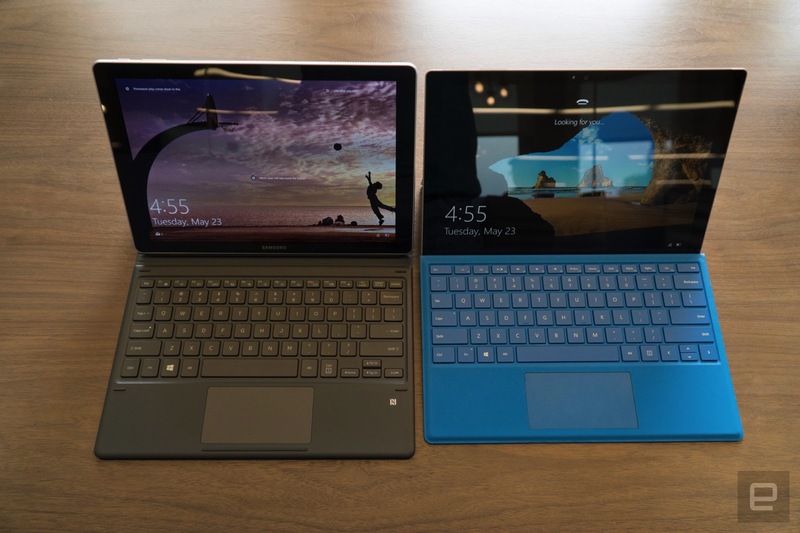 Otherwise, there's not a lot to differentiate the Galaxy Book from other Windows 10 devices. The S Pen works just fine with Windows Ink apps like Sticky Notes and Sketchpad, and the lack of latency is truly impressive -- it's one of the more responsive stylus experiences I've had. But it's not so much better than the Surface Pro that it should be a major consideration if you're deciding between the two devices. The Galaxy Book I've been testing includes a dual-core, seventh-generation Core i5 processor running at 3.1 GHz; it's paired with 8GB of RAM and a 256GB hard drive for a whopping $1,330. I thought that was expensive for a tablet, but it's in the same realm of pricing as a similarly configured Surface Pro, once you include a stylus and keyboard. This was more than enough power to meet my needs. My usual workflow includes several Chrome windows loaded up with around a dozen tabs as well as Slack, Todoist, Twitter, Microsoft's Groove Music (I figured I'd try the first-party option this time out) and Word. That all ran with nary a hiccup. I had also tried out a configuration of the Galaxy Book with only 4GB of RAM; unsurprisingly, that version didn't run nearly as well. I ran into pretty frequent Chrome tab refreshes, and music skipped from time to time. It still feels a bit cheap to offer only 4GB of RAM on a computer priced over $1,000 -- but Microsoft also only includes 4GB in the lower-end Surface Pro configurations, so at least Samsung isn't a total outlier here. 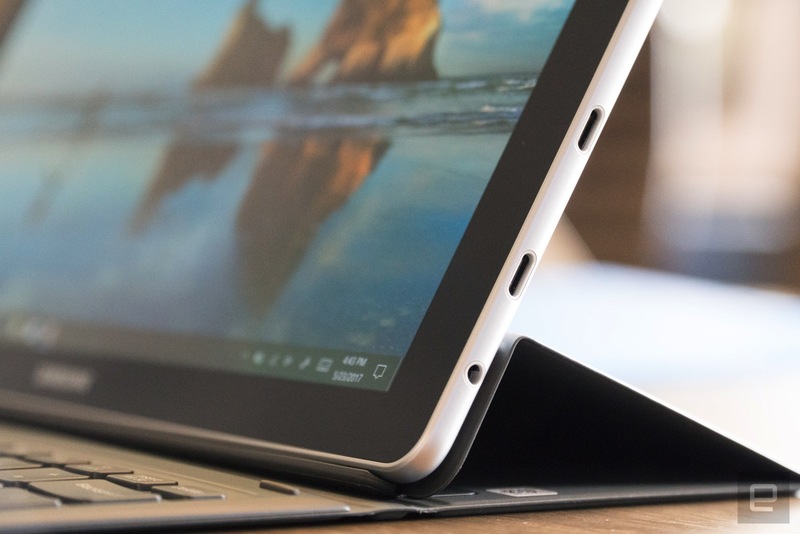 Benchmarks confirmed the unsurprising but welcome news that the Galaxy Book far outperforms last year's TabPro S. That should be obvious given the major chip upgrade here, but it's welcome news for people who may have enjoyed Samsung's form factor but not the somewhat sluggish performance. 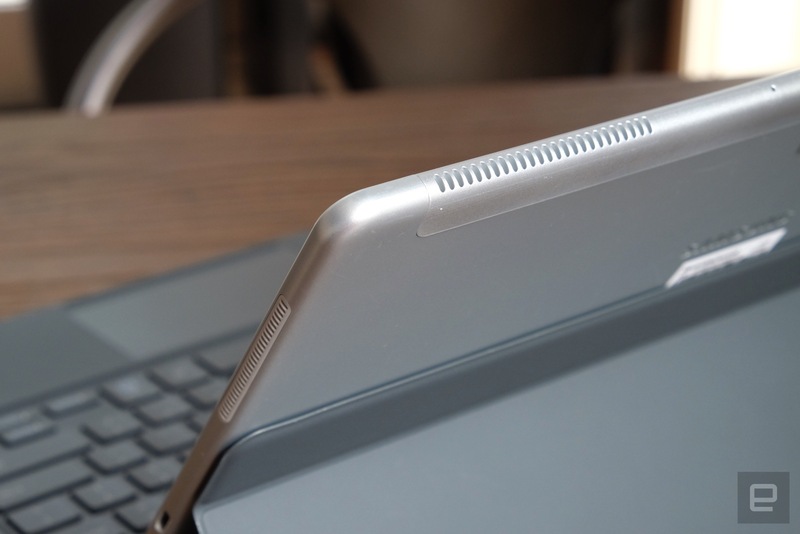 Overall, throwing more horsepower into the Galaxy Book definitely fixed the performance issues we saw with last year's TabPro S. Unfortunately, this also introduced a new problem of its own: battery life. The amount of useable time I got from the Galaxy Book was simply all over the place. The first model I tested was simply pathetic, with the computer regularly dying after less than three hours. It also took more than four hours to charge while in use. Both of these numbers seemed so bad that Samsung thought there was something wrong and sent me a replacement device. Initially, I had the same poor battery life with my replacement. But, after a few days, things seemed to normalize, and now I can get between five and six hours of work out of this computer. I don't know what changed, but things definitely improved after I ran our battery test. That test loops an HD video with the screen set to 66 percent brightness, and the Galaxy Book managed just over eight hours before it shut down. That's not terribly inspiring (Samsung promises 11 hours of video playback, a number I couldn't come close to), but it's not the total disaster I experienced the first few times I used the Galaxy Book. This is partially a matter of physics: A very thin body combined with a powerful processor like the Core i5 is going to be problematic. But devices like this are meant to be portable first and foremost, and I never felt all that comfortable leaving a charger behind. That's a big knock against what Samsung's trying to do here. Samsung describes the Galaxy Book as a "fast-charging" device, but that's only true if you're not using it. If the Surface Book is powered off, it does charge relatively fast, but if you're trying to do work and charge it, expect to wait three to four hours for a full battery. If you're out and about and want to just top the machine off, you had better be prepared to take a full break from your work. There are a host of different Galaxy Book configurations. 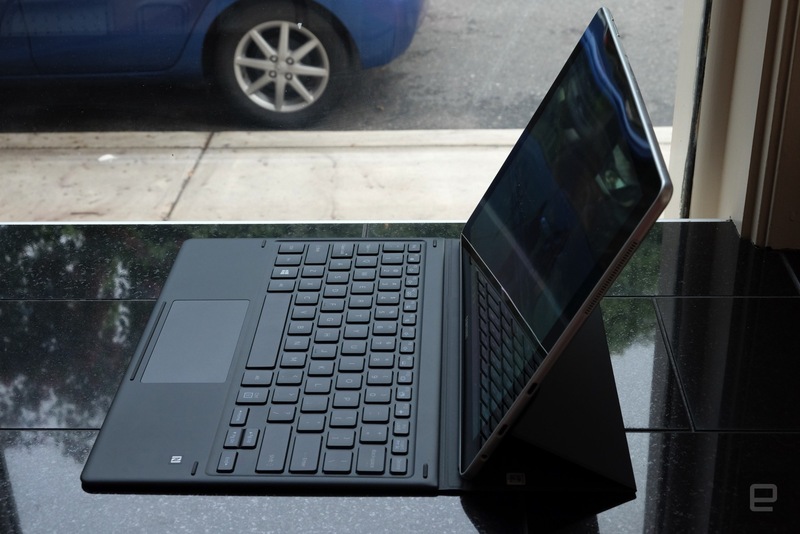 As tested, the 12-inch model I used includes a Core i5 processor, 8GB of RAM and 256GB of storage, and that costs a whopping $1,330, with keyboard and S Pen included. Samsung also sells a model with 4GB of RAM and 128GB of storage for $1,130; you can add Verizon LTE to that model for an additional $170. But the Surface Pro features a few advantages. Its screen is slightly bigger and runs at a higher resolution (2,736 x 1,824), and its built-in hinge is more flexible than Samsung's keyboard cover. Speaking of the keyboard, Microsoft's keyboard cover is far superior to Samsung's, as well. Naturally, the Surface Pro doesn't work with Samsung's Flow software that links the Galaxy Book to a Samsung smartphone, but that won't be a dealbreaker for many potential buyers. If you're deep in Samsung's ecosystem, you could make an argument for the Galaxy Book -- but most people will probably be happier with Microsoft's convertible. We'll need to fully review the new Surface Pro before we can say for sure, but Microsoft's track record here means it'll likely deliver. If you're not interested in buying from Microsoft, Lenovo's Thinkpad X1 tablet is another option -- but much like the Galaxy Book, there aren't a lot of compelling reasons for recommending it over a Surface Pro. Huawei's Matebook is another convertible with a similar design, but it has a terrible keyboard cover that makes it a complete non-starter. And while most people looking at the Galaxy Book probably need Windows 10 over iOS, we'd be remiss if we didn't mention the 12.9-inch iPad Pro. It's not cheap, but its screen is top rate, there are tons of apps that take great advantage of Apple's Pencil stylus and its battery life is superb. If you're an iPhone user, you'll appreciate the tight integration between your phone and tablet, as well. Just know that multitasking on iOS falls far short of Windows. Samsung's Galaxy Book doesn't get anything totally wrong. And if it were a few hundred dollars cheaper than the Surface Pro, it could find an audience. But as it is, the good things about the Galaxy Book (its display and overall performance) are come with some big tradeoffs. Battery life in particular has been a big letdown, and though the keyboard cover is better than it was last year, it's still not as good as what Microsoft offers. Battery life and a good typing experience are essentials, particularly on a mobile device like the Galaxy Book. 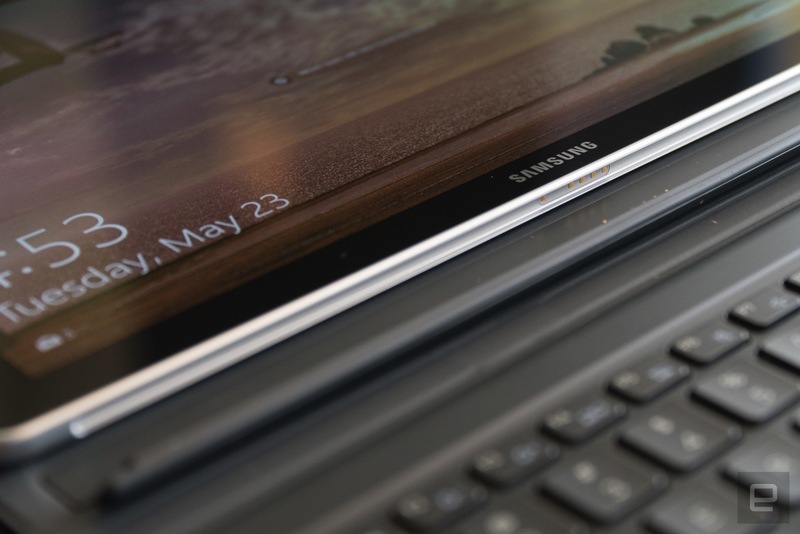 Given the compromises, it's hard to recommend Samsung's latest over the Surface Pro. For its price, the Galaxy Book needs to be near-flawless. Unfortunately, it doesn't reach that lofty goal.